“Go Green,” “Green Business,” “Green Office,” and Zero Landfill" are some of the buzzwords of the current era. While more and more businesses are going green every day, some businesses still lag. Others lose momentum when they run out of waste reduction ideas. 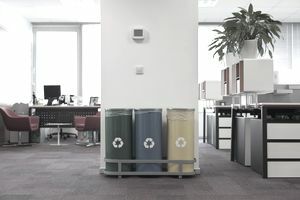 Here are some easy-to-implement office waste reduction tips and ideas. Maybe the best idea for reducing paper waste is through creating a paperless office. You can simply say no to paper use. If that is not completely possible, you should identify for what purposes you have to use paper and for what purposes you can avoid paper use. Once you make the lists for both, then be sure to clearly announce the policy and consistently enforce it. Encourage everybody in the office to edit on computers before printing. This move will help reduce the number of draft copies of documents to be printed. If you still think printing drafts is necessary, print them on the unused side of paper sheets that would otherwise be discarded. Use both sides of a paper. Set up computers to automatically print two-sided as well. Use small paper pieces for short memos. Consider not using cover sheets on faxes. Get rid of needless reports and reduce report sizes. If you only occasionally need a report, just run it on demand. Consider using lighter weight papers wherever possible. Enable the reuse of paper envelopes by putting a label on top of the old address. Make use of electronic and voicemail and avoid paper mail wherever possible. Take necessary actions to decrease unsolicited mail. Share and circulate documents, memos, reports and all other publications. Post all workplace announcements in a central location rather than printing multiple copies. Use single spacing and narrower margins for less important documents. Try to find duplication on your mailing lists and avoid sending unnecessary copies. Be sure to recycle scrap paper. Shredded office paper may also be repurposed as packaging filler for particular applications. Think about purchasing products with less packaging or with no packaging at all. Alternatively, request that your office deliveries be shipped in returnable containers and return the emptied containers back to the supplier. Always ask the vendors to take packaging back. There may be the possibility that they can reuse it or at least generate greater quantities which will enhance the feasibility of recycling. Make the most of your ink and toner cartridges. Consider renting equipment that you use only occasionally rather than having to store it in the workplace. Always try to invest in high-quality equipment that is durable and repairable. Encourage employees to have reusable silverware, plates, and cups at their desks. Encourage them to bring their lunch to work in reusable containers. The composting of food scrap is a useful approach for diverting it from landfill. Increasingly, compost removal services are available. Where the opportunity permits, you might want to consider having your own compost bin. Select plant landscaping that requires low maintenance and produces less waste. Recycle electronic equipment, batteries, plastic, metal cans, white paper, and beverage containers. Consider having a partnership with a local recycler if your office generates a significant amount of such materials. And remember, don't allow obsolete equipment to take up space and collect dust. The sooner it is recycled, the quicker that valuable resources will be available for reuse, thus avoiding the processing of more virgin materials. It goes without saying, of course, that waste reduction is not the only thing that you need to declare for your business or office to truly be “Green”. The products and services your business offer should be environmentally friendly as well. Increasingly, businesses are recognizing the value of focusing on the overall sustainability of their operations.